A non-active Jakarta governor Basuki "Ahok" Tjahaja Purnama was convicted of two years’ imprisonment for blasphemy against Islam on May 9, has triggered a massive rallies from his supporters around the world. Indonesian living in Tokyo held a similar solidarity rally on Sunday evening, May 14 2017 at Odaiba, Tokyo. It was a cloudy afternoon at Odaiba, Tokyo, but somehow it got warmer towards evening when at least 300 Indonesians slowly marched toward the beach for a solidarity event for Indonesia. 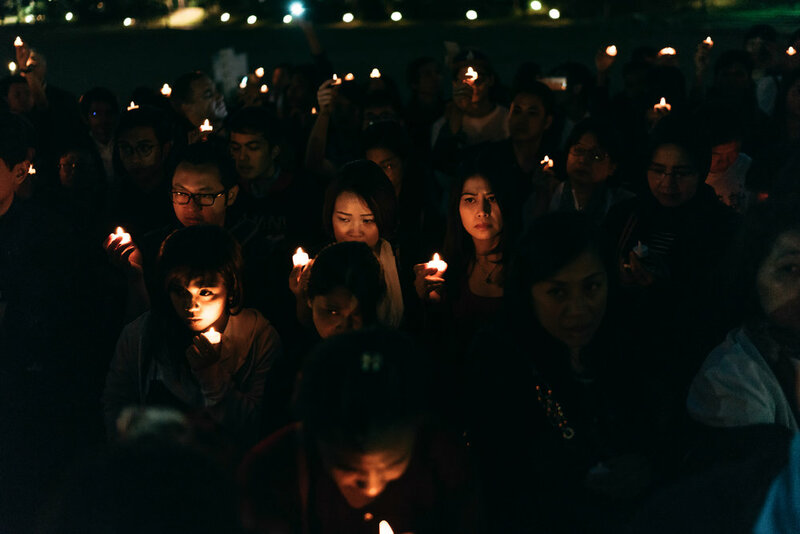 The event was subtly titled 'A hundred candles from Japan to Indonesia'. But from the passionate opening speech, it was immediately clear that like dozens of similar rallies held around the world this weekend, it was a show of defiance by concerned citizens against the unjust conviction of a non active Jakarta governor, Basuki Tjahaja Purnama, also known as Ahok. 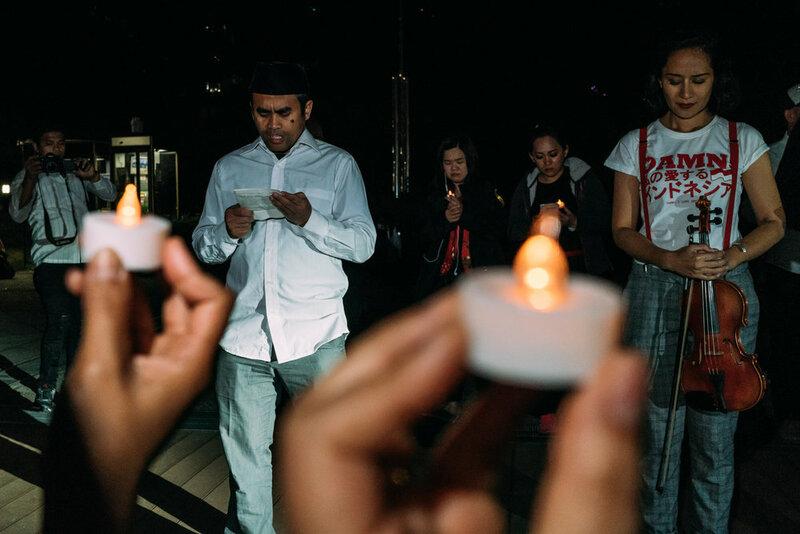 Prayers led by an ulama, a pastor, a Hindu priest and Buddhist clergy, poems, and a solemn candlelight vigil expressed our grave concern over growing intolerance in Indonesia. The event ended serenely with a beautiful chorus of the national anthem 'Indonesia Pusaka', and with renowned Indonesian musician Maylaffayza playing the violin. An hour that will be remembered as a strong of unity by Indonesians marching to defend justice and diversity in their home country. 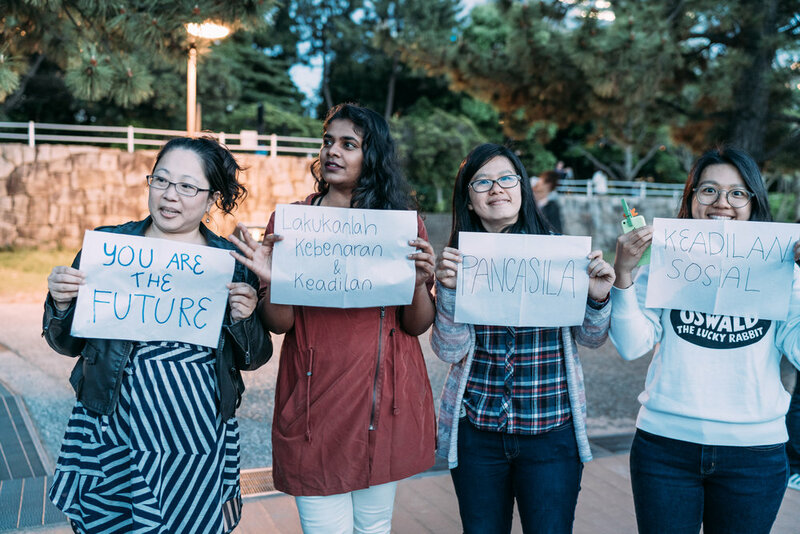 Indonesian people in Tokyo show support and seek justice for non active Jakarta governor, Basuki “Ahok” Tjahaja Purnama. Three Indonesian anthems, Indonesia Saya, Tanah Airku, and Indonesia Pusaka was sung together led by Indonesian musician Maylaffayza playing the violin.